A Film Director and Producer, Ajita is a former alumnus of the Film Institute, Pune (FTII) and studied Science and Theatre from 1995-2000. Her short features have been showcased widely around the globe and acclaimed for their visually beautiful and experimental style of filmmaking. Short Feature ‘Notes On Her’ was an OSCAR entry in 2003. 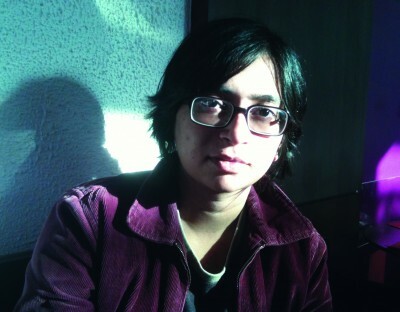 Her great passion for Cinema and film making, led her to found her own Film Company Imaginem Cinema Pvt Ltd, which she established to create the necessary space for imaginative and provocative cinema in India in 2009. Her gritty, passionate and poetic feature film ‘Ballad of Rustom’ which she has written, directed and produced is premiering at the 12th Osian’s Cine Fan Film Festival in New Delhi on 28th, July 2012. My earliest childhood influences came from my parents and grandparents: my father is a graphic artist, photographer and cartoonist and also loved Cinema. I have spent much of my childhood cutting art works, doing design layouts and printing photographs, and watching films with Dad and then there was the atmosphere at home-no restrictions! I remember watching movies since I was 5 years-I would get up at 4 am before school and watch films-it was that time when I could be completely alone with myself and be lost in a film-I would be watching late night Metro movies at 12:00 am-and they never restricted me-studies were never a priority-my parents believed first that I must get a holistic education. It’s another matter that I turned out to be a gold medalist in College. My maternal grandfather was considered the maverick in the family. A writer and theatre guy, who had spent many years in Southern India dabbling in films; he owned theatres in early 50s showing Hollywood classics. My Paternal grandfather was a singer-actor and sculptor and did street theatre roaming in troupes. Pursuing filmmaking was always at the back of my mind, though I couldn’t make up my mind till after Graduation. At home there was a history of my grandfather and then my parents trying to make films; and they were not too keen on another artist in the house though they never expressed this strongly ever. So when I decided to discontinue my studies in Science (I was training to be a scientist), my parents merely asked me to rethink if this is what I badly wanted, and then I was in FTII during those turbulent uncertain years in 2000! …but they were defining years in my life…! For me it’s both..it’s intuitive to a large extant for me..I think no one can “teach” you how to make films-that’s something very very individualistic..it has been in my case. However Film Education and Film schools are important to hone one’s craft, and also start respecting the practice of filmmaking since it is a very very intense process-and it’s a scientific, technical as well as artistic practice, and one needs to understand this very much. For many Film Institutes are still those wonderful places to discover Cinema; watch films from different cultures, and spend time introspecting and slowly evolving one’s one mis-en-scenes. As I spoke earlier, watching films since I was a kid was important for me. However it is the kind of Cinema that I have been exposed to coupled with the free atmosphere at home; the dialogue I had with my parents at an early age that have really shaped me today. Perhaps the skills in photography and Art work, printing pictures etc really made me more and more detailed and also today made me realize the importance of doing something with attention, and also being skillful with the techniques. I can get very impatient and restless but some things sort of grounded me. Now photo printing is out dated but when you print photos you wait and wait and wait in the dark room and wait for those chemicals to create images!. Straight after FTII I had a few offers to make regular formula films back in the South, though I felt they were taking time to make decisions and also I did not want to succumb to the pressures of making films where you are required to duplicate something which has worked in some form in some country abroad. I decided I wanted to make films that I believed in. I started travelling to write my scripts and Ballad started with ‘Images’ as I travelled and ‘Ballad’ also comes from my own life: the people in my life: the countryside which was always there as my grandparents and even my parents moved away from the countryside to live in cities but our roots are there, and we we cannot seem to escape those narratives. My films always start with images and then come the stories. Freelance work was low and I was not even working continuously. I did some odd corporate work for sustenance, so things were tough for few years. But that time was potent and beautiful. I was driven to make what I wanted, and ‘Ballad’ happened during those years of unrest; the whole restlessness made me write, and read feverishly and keep thinking, shaping my ideas, and then I decided I cannot go on waiting, so I decided with all the risks at hand let me launch my own production house; which incidentally is funded by my mother, a very very courageous lady. We started with small corporate work and we are still struggling but I managed to gather money for ‘Ballad of Rustom’. It was a mad time when I decided to make ‘Ballad of Rustom’. There were several hurdles: location, actors, and I am particular, so it also took time-7-8 months zeroing on the right locations, and I wanted to cast ‘actors’ who were not really stars, rather unexposed faces, for the authenticity of the characters’ looks, so spent lot of time looking for the right ensemble. The shooting also spread into a few months. I wanted the righ light and mist, and then negative; I wanted to shoot film and I was also keen on a bleach by-pass so it all took time. And Music again! Something I love so it took over year and half to get it going. It’s very instinctive. I don’t really plan. It could be an ‘image’, a conversation or a place that just sparks off something in the subconscious and you begin… my greatest inspiration is life and the people I have had the privilege of knowing; specially my parents! Of course, literature always does something to you; it makes you richer as a human being as you read you enter a world and you imagine, which you also do in the darkened cinema hall or walking on the street. I don’t believe in ‘a particular’ genre… I am doing something today, I may do something else tomorrow. I love to play, of course there are somethings I may not touch; like raw slapstick (laughs! )… I love humour though, Wodehouse to Woody Allen. I think this is a good question (laughs!. ).I’d say this whole film has been risky… and I have risked quite a bit on this film. And I do believe strongly in taking risks in my work. I improvise and sometimes I can really overhaul what I planned, so there is really no formula structure for me. My life has been quite a rocky road… but that is something I love. There is no point living life if you don’t risk, and sometimes you have to risk everything! I don’t believe in structured life. No! I think a very film literate audience may be really perceptive. However everyone ends up dissecting films and there is nothing wrong with that; but it would also be more interesting if they really knew why a Director has crafted something in a certain way. Why a new device is used? If something is not easily understandable it is dismissed off. Or put into a bracket. But this is where the dialogue should happen. And that’s where we need to widen the net for increasing awareness on Cinema and the discipline that goes behind making films. I think story is incidental in Cinema; what is important is the cinematic experience which should be a beautiful blend of technique and human experiences. The whole magic of Cinema is the unknown; not everything is spoken, not everything revealed and there lies the magic! Well… I wish we could have stars who played characters and not themselves in India. They try hard to play characters but often we see only their ‘faces’; there is way too much importance given to glamour and shining bodies on screen. I do like well built fit people but one also needs to see intelligence and character through them. I think every human being is a landscape in himself… of course if we have perceptive hard working stars who want to break their comfortable images then we must see what is possible there. Yes it does; for instance I love 35mm film but how long can one continue to make films in 35mm. When I hear that the labs will stop processing emulsion in a year from now, then I wonder is this true? or a market creation? And I am very excited by new tools and technology and I think any tool can be used to create a world on screen. But that tool is not necessarily what I love; there’s a difference between an Ink pen and a digital pen! But I love technology so despite my preferences I will use new pens to paint pictures! YOoohhh…!!! tough tough… well I’ll settle for ‘Butch Cassidy and Sundance Kid’ and ‘Andrei Rubelev’ : two extremes I love and Directors, well… Frederico Fellini, Sidney Pollack, and Tarkovsky. A huge role of course! And every film is a commercial entity end of the day but it does not mean we have to subscribe to every rule in the book… first create something unique, have the guts for it and then try creating a market for this product rather then you playing by the market all times! Marketing very very much. It’s not that good stories are often accepted or that good films find audiences: it’s how you position the two. Of course it’s a bonus if both good film and marketing, are going hand in hand then something special is seen. Yes quite a few; specially reluctance to accept new ideas, also reluctance to see ‘individuals’. I have always stuck to my very individualistic approach to life and Cinema and often that is not perhaps understood; there is so much conditioning in society which has to slowly change. Well honestly there have been ‘miracles’ in this journey and I loved them and thankfully all wishes are not fulfilled so you try harder and harder and then you win some you loose some. But that’s the game and I love it…! How important is an EP to a director? Key to the Director… specially when it comes to rolling the production but in smaller setups the stratification is hazy and it’s fine. Another Film! I need to set the ball rolling fast. Love your job! You are doing it for yourself end of the day; specially making films- not for anyone else and no escaping hard work and discipline! Yeah… forgetting to re-stock on one occasion and missing some interesting shots! A science fiction film I hope I can make sometime in the near future!